Dr. Costas Sachpazis presents a useful animated video for construction professionals. The video is based on a retaining wall of reinforced concrete (steel bar reinforcement). A retaining wall refers to a structure specifically designed and built-up to withstand the lateral pressure of soil if any anticipated variation occurs in ground elevation that surpasses the angle of repose of the soil. The retaining walls are utilized to bound soils amid two dissimilar elevations frequently in areas of terrain occupying unwanted slopes or in areas where the landscape should be structured rigorously and engineered for more definite reasons like hillside farming or roadway overpasses. Retaining wall is built with masonry and reinforced concrete. For masonry retaining wall, the thickness of wall rises with height as masonry stands the lateral pressure with its weight. So it is also known as gravity retaining wall. 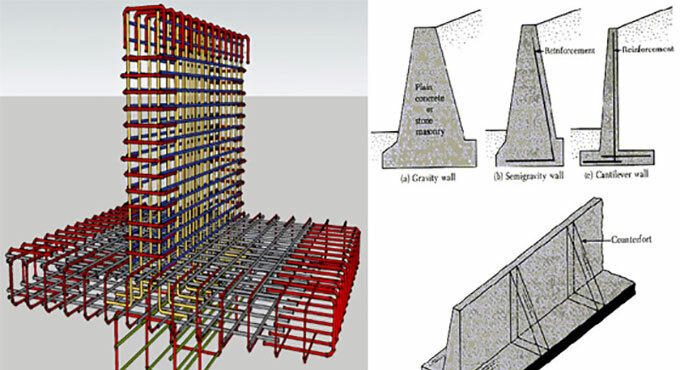 Whereas the reinforced concrete retaining wall withstands the lateral pressure with structural action like bending and causes thinner section.